比利时，德平特，Moerkensheide别墅 / Dieter De Vos Architecten - ArchGo! From the architect. The house is centrally positioned on the building plot at the edge of a residential neighbourhood and opposite a small forest. An explicit orientation to the sun shapes the tripartite composition of the house. Three gardens formally complement the composition, each garden intended for a specific time of day: morning, afternoon, evening. 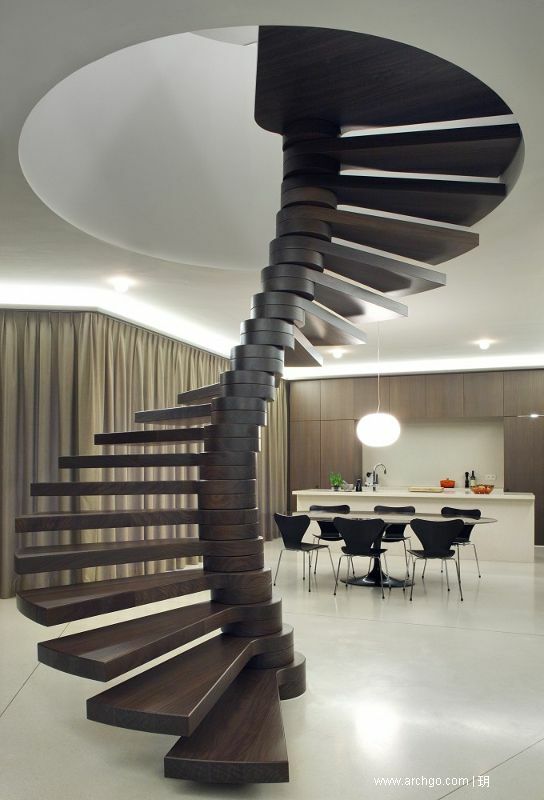 A self-supporting spiral staircase leads to the upper floor. Three freestanding cabinets separate three rooms from the hallway. These cabinets contain storage space as well as technical equipment and sanitary cells. The rooms can be closed off from the hallway through invisibly detailed doors in the cabinets. On the upper floor, daylight is provided through perforations situated only on the end walls and in the flat roof. The uninterrupted perimeter wall is executed in ivory painted blockwork in contrast to the smooth lacquered cabinets.